William Siegel was a Yiddish playwright who wrote 150 plays, most of which were comedies. Most of these were produced on New York City's Lower East Side. Perhaps Siegel was best known for his play "The Great Moment," which ran during the 1927-8 season at Max Gabel's theatre. This production featured the actors Max Gabel and Jenny Goldstein. 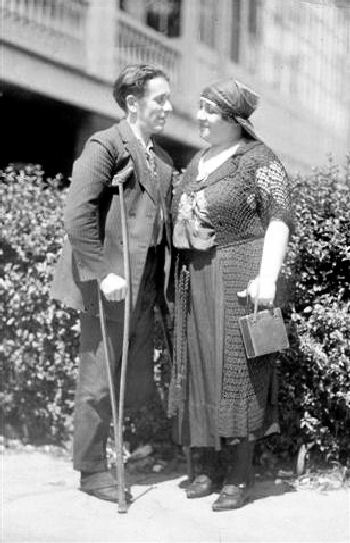 His works include "Der Shikker," (known in English as "The Drunkard"), "Bublitchki," which starred the wonderfully comedic Menasha Skulnik and Molly Picon, and "The Jewish Cowboy." A few of Siegel's works were made into musicals by Joseph Rumshinsky and Sholom Secunda. Vera Gordon, née Vera Nemirou, was born in Russia in 1886. She immigrated to New York with her family in 1904 where she began to work in the Yiddish theatre. Subsequently, Gordon found work in vaudeville, both in the United States and Great Britain. In 1920, Gordon began her film career, at first in silent films and then in talkies, mostly playing character roles such as that of the Jewish mother and family matriarch. Gordon passed away in 1948, Siegel in 1966.